AND THE COMMUNION OF THE SAME. ¶ The Prieste entring into the sicke persones house, shall saye. When he commeth into the sicke mannes presence, he shall saye this psalme. HEARE my prayer, (o lorde,) and Consider my desire : herken unto me for thy trueth and righteousnes sake. And entre not into judgemente with thy servaunt : for in thy sight shal no man living be justified. For the enemie bath persecuted my soule : he hath smitten my life downe to the grounde : he hath laied me in the darkenesse, as the men that have bene long dead. Therefore is my spirite vexed within me : and my harte within me is desolate. Yet doe I remembre the time paste, I muse upon all thy woorkes : yea, I exercise myselfe in the workes of thy handes. I stretche forth mine handes unto the : my soule gaspeth unto the as a thyrstie lande. Heare me, (o lorde) and that soone : for my spirite weaxeth faint hide not thy face from me, lest I be like unto them that goe downe into the pitte. O leate me heare thy lovyng-kyndenesse betimes in the morning, for in thee is my trust : shewe thou me the waie that I should walke in for I lift up soule unto thee. Deliver me, (o lorde,) from myne enemies : for I flye unto thee to hide me. Teache me to dooe the thynge, that pleaseth thee, for thou art my god, leate thy loving spirite leade me foorth unto the lande of righteousnesse. Quicken me, (o lorde) for thy names sake, and for thy righteousnesse sake bring my soule out of trouble. And of thy goodnesse slaie my enemies and destroye all them that vexe my soule, for I am thy servaunt. Glory to the father and to the sonne, &c.
REMEMBRE not Lord our iniquities, nor the iniquities of our forefathers. Spare us good Lord, spare thy people, whom thou hast redemed with thy most precious bloud, and be not angry with us for ever. Lorde have mercye upon us. Christe have mercie upon us. Lorde have mercie upon us. Our father, whiche art in heaven, &c.
Answere. But deliver us from evill. Amen. The Minister. O lorde save thy servaunte. Answere. Whiche putteth his trust in the. Minister. Sende hym helpe from thy holy place. Answere. And evermore mightily defende hym. Minister. Leat the enemie have none advauntage of hym. Answere. Nor the wicked approche to hurte hym. Minister. Bee unto hym, o lorde, a strong tower. Answere. From the face of his enemie. Minister. Lord heare my prayer. Answer. And let my crye come unto thee. O LORD looke downe from heaven, beholde, visite, and releve this thy servaunte: Looke upon hym with the iyes of thy mercy, geve hym coumforte, and sure confidence in thee: Defende him from the daunger of the enemie, and kepe hym in perpetual peace, and safetie: through Jesus Christe our Lorde. Amen. Heare us, almightie and moste merciful God, and Saviour: Extende thy accustomed goodnesse to this thy servaunt, which is greved with sickenesse: Visite hym, o Lorde, as thou diddest visite Peters wifes mother, and the Capitaines servaunt. And as thou preservedst Thobie [Tobit] and Sara by thy Aungel from daunger: So restore unto this sicke person his former helth, (if it be thy will), or els geve hym grace so to take thy correccion, that after this painfull lyfe ended, he maye dwell with thee in lyfe everlastyng. Amen. Then shall the Minister exhorte the sicke person after this fourme, or other lyke. DERELY beloved, know this that almighty God is the Lorde over lyfe, and death, and over all thynges to them perteyning, as yougth, strength, helth, age, weakenesse, and sickenesse. Wherfore, whatsoever your sickenes is, knowe you certaynly, that it is Gods visitacion. And for what cause soever this sickenesse is sent unto you; whether it bee to trye your pacience for the example of other, and that your fayth may be founde, in the day of the Lorde, laudable, glorious, and honourable, to the encrease of glory, and endelesse felicitie: Orels it be sent unto you to correcte and amende in you, whatsoever doeth offende the iyes of our heavenly father: knowe you certainly, that if you truely repent you of your synnes, and beare your sickenes paciently, trusting in Gods mercy, for his dere sonne Jesus Christes sake, and rendre unto him humble thankes for his fatherly visitacion, submytting yourselfe wholy to his wil; it shal turne to your profite, and helpe you forewarde in the ryght waye that leadeth unto everlastyng lyfe. * Take therfore in good worthe, the chastement of the lorde: For whom the lorde loveth he chastiseth. Yea, (as saincte Paul sayth,) he scourgeth every sonne, which he receiveth: yf you indure chastisement, he offereth himselfe unto you as unto his owne children. What sonne is he that the father chastiseth not? Yf ye be not under correccion (wherof all the true children are partakers), then are ye bastardes, and not children. Therfore seyng that whan our carnal [=earthly] fathers doe correct us, we reverently obey them, shall we not now much rather be obedient to our spirituall father, and so live? And they for a fewe daies doe chastise us after theyr owne pleasure: but he doeth chastise us for our profite, to thentente [the intent] he maye make us partakers of his holines. 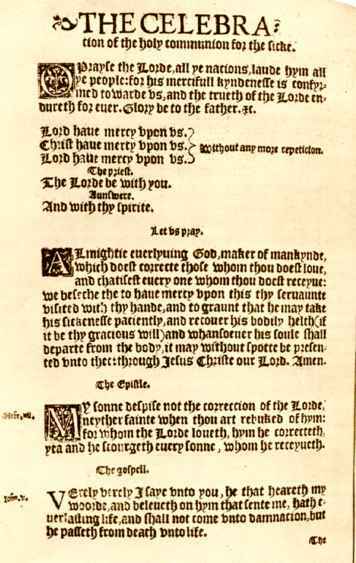 These wordes, good brother, are Gods wordes, and wryten in holy scripture for our coumfort and instruccion, that we should paciently and with thankesgevyng, beare our heavenly fathers correccion: whansoever by any maner of adversitie it shall please his gracious goodnesse to visite us. And there should be no greater coumfort to christian persons, then to be made lyke unto Christ, by sufferyng paciently adversities, troubles, and sickenesses. For he himselfe wente not up to joy, but firste he suffered payne: he entred not into his glory, before he was crucified. So truely our waye to eternall joy is to suffre here with Christe, and our doore to entre into eternal life: is gladly to dye with Christe, that we may ryse againe from death, and dwell with him in everlasting life. Now therfore taking your sickenesse, which is thus profitable for you, paciently: I exhorte you in the name of God, to remembre the profession, which you made unto God in your Baptisme. And forasmuch as after this lyfe, there is accompte to be geven unto the ryghteous judge, of whom all must be judged without respecte of persons: I require you to examine yourselfe, and your state, both towarde God and man, so that accusyng and condemnyng yourselfe for your owne faultes, you may fynde mercy at our heavenly fathers hande, for Christes sake, and not be accused and condemned in that fearfull judgement. Therfore I shall shortely rehearse the articles of our fayth, that ye maye knowe whether you doe beleve as a christian manne should beleve, or no. Here the minister shall rehearse the articles of the fayth saying thus. DOEST thou beleve in God the father almyghtie? And so forth as it is in Baptisme. * If the person visited bee very sicke, then the curate may end his exhortacion at this place. Then shall the minister examine whether he be in charitie with all the woride. Exhortyng hym to forgeve from the botome of his herte al persons, that have offended hym, and yf he have offended other, to aske them forgevenesse: and where he hathe done injurye or wrong to any manne, that he make amendes to hys uttermoste power. And if he have not afore disposed his goodes, let him then make his will. (But men must be oft admonished that they set an ordre for their temporall goodees and landes whan they be in helth.) And also to declare his debtes, what he oweth, and what is owing to him: for discharging of his conscience, and quietnesse of his executours. * The minister may not forget nor omitte to move the sicke person (and that moste earnestly) to lyberalitie towarde the poore. * This may be done before the minister begyn his prayers, as he shal see cause. ¶ Here shall the sicke person make a speciall confession, yf he fele his conscience troubled with any weightie matter. After which confession, the priest shall absolve hym after this forme: and the same forme of absolucion shalbe used its all pryvate confessions. OUR Lord Jesus Christ, who hath lefte power to his Churche to absolve all sinners, which truely repent and beleve in hym: of his great mercy forgeve thee thyne offences: and by his autoritie committed to me, I absolve thee from all thy synnes, in the name of the father, and of the sonne, and of the holy gost. Amen. And then the priest shall saye the collette folowyng. O MOST mercifull God, which according to the multitude of thy mercies, doest so putte away the synnes of those which truely repent, that thou remembrest them no more: open thy iye of mercy upon this thy servaunt, who moste earnestly desireth pardon and forgevenesse: Renue in hym, moste lovyng father, whatsoever hath been decayed by the fraude and malice of the devil, or by his owne carnall wyll, and frailnesse: preserve and continue this sicke membre in the unitie of thy Churche, consyder his contricion, accepte his teares, aswage his payne, as shalbe seen to thee moste expedient for him. And forasmuch as he putteth his full trust only in thy mercy: Impute not unto him his former sinnes, but take him unto thy favour: through the merites of thy moste derely beloved sonne Jesus Christe. Amen. Then the minister shall saye this psalme. In te Domine speravi. Psal. lxxi. IN thee, O Lorde have I put my trust, let me never be put to confusion, but ridde me, and deliver me into thy righteousnes : enclyne thyne eare unto me, and save me. Be thou my strong holde (wherunto I may alwaye resorte) thou haste promysed to helpe me : for thou art my house of defence, and my castell. Deliver me (O my God) out of the hande of the ungodly, out of the hande of the unrighteous and cruell man. For thou (O Lord God) art the thyng that I long for, thou art my hope, even fro my youth. Through the have I been holden up ever since I was borne, thou art he that tooke me out of my mothers wombe; my prayse shalbe alwaye of thee. I am become as it were a monster unto many : but my sure trust is in thee. Oh let my mouth be filled with thy prayse (that I may syng of thy glory) and honour all the daye long. Cast me not awaye in the tyme of age, forsake me not when my strength fayleth me. For mine enemies speake against me : and they that lay waite for my soule take their cousayle together, saying : God hath forsaken hym, persecute hym, and take hym, for there is none to delyver hym. Goe not ferre fro me, O God : my God, haste thee to helpe me. Let them be confounded and perishe, that are againste my soule : let them be covered with shame and dishonour, that seke to doe me evill. As for me, I will paciently abyde alwaye, and wyll prayse thee more and more. My mouth shall dayly speakeof thy righteousnes and salvacion, for I knowe no ende therof. I will goe forth in the strength of the Lorde God : and will make mencion of thy righteousnesse onely. Thou (O God) haste taught me from my youth up until now, therfore wil I tel of thy wonderous workes. Forsake me not (O God) in myne olde age, when I am gray headed, untill I have shewed thy strength unto this generacion, and thy power to all them that are yet for to come. Thy righteousnesse (O God) is very high, and great thinges are they that thou haste doen : O God who is lyke unto thee? O what great troubles and adversities hast thou shewed me? and yet diddest thou turne and refreshe me : yea, and broughtest me from the depe of the earth agayne. Thou haste brought me to great honour, and coumforted me on every side. Therfore will I prayse thee and thy faithfulnes (O God) playing upon an instrument of musicke, unto thee will I syng upon the harpe, O thou holy one of Israel. My lippes will be fayne, when I syng unto thee: and so will my soule whom thou haste delyvered. My tounge also shall talke of thy righteousnesse all the daye long, for they are confounded and brought unto shame that seke to doe me evyll. O SAVEOUR of the world save us, which by thy crosse and precious bloud hast redemed us, helpe us we beseche the, O God. Then shall the minister saye. THE almighty Lord, whiche is moste strong tower to all them that put their trust in hym, to whom all thynges in heaven, in earth, and under earth, doe bowe and obey: be now and ever more thy defence, and make thee knowe and fele, that there is no other name under heaven geven to man, in whom and through whom thou mayest receyue helth and salvacion, but only the name of our Lorde Jesus Christe. Amen. As with this visible oyle thy body outwardly is annoynted: so our heavenly father almyghtye God, graunt of his infinite goodnesse, that thy soule inwardly may be annoynted with the holy gost, who is the spirite of al strength, coumforte, reliefe, and gladnesse. And vouchesafe for his great mercy (yf it be his blessed will) to restore unto thee thy bodely helth, and strength, to serve him, and sende thee release of al thy paines, troubles, and diseases, both in body and minde. 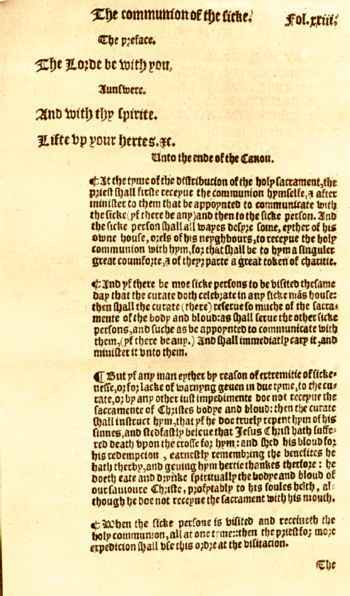 And howsoever his goodnesse (by his divyne and unserchable providence) shall dispose of thee: we, his unworthy ministers and servaunts, humbly beseche the eternall maiestie, to doe with thee according to the multitude of his innumerable mercies, and to pardon thee all thy sinnes and offences, committed by all thy bodily senses, passions, and carnall affeccions: who also vouchsafe mercifully to graunt unto thee gostely strength, by his holy spirite, to withstand and overcome al temptacions and assaultes of thine adversarye, that in no wise he prevaile against thee, but that thou mayest have perfit victory and triumph against the devil, sinne, and death, through Christ our Lord: Who by his death hath overcomed the Prince of death, and with the father, and the holy gost evermore liveth and reigneth God, worlde without ende. Amen. Usque quo, Domine. Psalm xiii. How long wilt thou forget me, (O Lord,) for ever? how long wilt thou hyde thy face from me? How long shall I seke counsell in my soule? and be so vexed in myne herte? how long shall myne enemye triumph over me? Consydre, and heare me, (O lord my God): lighten myne iyes, that I slepe not in death. Leste myne enemy saye: I have prevayled against hym: for yf I be cast downe, they that trouble me will reioyce at it. But my trust is in thy mercy: and my herte is joyfull in thy salvacion. I will sing of the lord, because he hath delte so lovingly with me. Yea, I wyll prayse the name of the Lord the most highest. Glory be to the, &c. As it was in the, &c.
Forasmuche as all mortal men be subject to many sodaine perils, diseases, and sickenesses, and ever uncertaine what time they shall departe out of this lyfe: Therfore to thentent [the intent] they may be alwayes in a readinesse to dye, whensoever it shall please almighty God to call them: The curates shall diligently from tyme to tyme, but specially in the plague tyme, exhorte theyr paryshoners to the ofte receyvyng (in the churche) of the holy communion of the body and bloud of oure Savioure Christe: whiche (yf they doe) they shall have no cause in theyr sodaine visitacion, to be unquyeted for lacke of the same. But if the sicke person be not hable to come to the churche, and yet is desirous to receyve the communion in his house, then he must geve knowlage over night, or els early in the morning to the curate, signifying also howe many he appoynted to communicate with hym. And yf the same daye there be a celebracion of the holy communion in the churche, then shall the priest reserve (at the open communion) so muche of the sacrament of the body and bloud, as shall serve the siche person, and so many as shall communicate with hym (yf there be any.) And so soone as he convenientely may, after the open communion ended in the church, shall goe and minister the same, firste to those that are appoynted to communicate with the sicke (yf there be any), and last of all to the sicke person himselfe. But before the curate distribute the holy communion: the appoynted generall confession must be made in the name of the communicantes, the curate addyng the absolucion with the coumfortable sentences of scripture folowyng in the open communion, and after the communion ended, the collecte. ALMIGHTIE and everlyvyng God, we moste hertely thanke thee, &c.
¶ But yf the daye be not appoynted for the open communion us the churche, then (upon convenient warning geven) the curate shal come and visite the sick person afore noone. And having a convenient place in the sicke mans house (where he may reverently celebrate) with all thinges necessary for the same, and not beyng otherwyse letted [=hindered] with the publike service. or any other just impediment; he shal there celebrate ye holy communion after suche forme and sorte as hereafter is appoynted. of the holy communion for the sicke. O PRAYSE the Lorde, all ye nacions, laude hym, all ye people: for his mercifull kyndenesse is confyrmed towarde us, and the trueth of the Lorde endureth for ever.Glory be to the father, &c.
ALMIGHTIE everlyving God, maker of mankynde, which doest correcte those whom thou doest love, and chatisest every one whome thou doest receyve: we beseche the to have mercy upon this thy servaunte visited with thy hande, and to graunt that he may take his sickenesse paciently, and recover his bodily helth (if it be thy gracious will), and whansoever his soule shall departe from the body, it may without spotte be presented unto thee: through Jesus Christe our Lord. Amen. MY sonne, despise not the correccion of the Lorde, neyther fainte when thou art rebuked of hym: for whom the Lorde loveth, hym he correcteth, yea and he scourgeth every sonne whom he receyveth. VERELY, verely I saye unto you, he that heareth my woorde, and beleveth on hym that sente me, hath everlasting life, and shall not come unto damnacion, but he passeth from death unto life. ¶ Lifte up your hertes, &c.
Unto the ende of the Canon. ¶ At the tyme of the distribucion of the holy sacrament, the prieste shalt firste receyve the communion hymselfe, and after minister to them that be appoynted to communicate with the sicke (yf there be any), and then to the sicke person. And the sicke person shall all wayes desyre some, eyther of his owne house, or els of his neyghbours, to receyve the holy communion with hym; for that shall be to hym a singuler great coumforte, and of theyr parte a great token of charitie. ¶ And yf there be moe sicke persons to be visited the same day that the curate doth celebrate in any sicke mans house; then shall the curate (there) reserve so muche of the sacramente of the body and bloud: as shall serve the other sicke persons, and suche as be appoynted to communicate with them (yf there be any). And shall immediatly cary it, and minister it unto them. ¶ But yf any man eyther by reason of extremitie of sickenesse, or for lacke of warnyng geven in due tyme, to the curate, or by any other just impedimente, doe not receyne the sacramente of Christes bodye and bloud then the curate shall instruct hym, that yf he doe truely repent hym of his sinnes and stedfastly beleve that Jesus Christ hath suffered death upon the cosse for hym, and shed his bloud for his redempcion, earnestly remembring the benefites he hath therby, and geving hym hertie thankes therfore; he doeth eate and drynke spiritually the bodye and bloud of our savioure Christe, profitably to his soules helth, although he doe not receyve the sacrament with his mouth. ¶ When the sicke persone is visited and receiveth the holy communion, all at one tyme: then the priest for more expedicion shall use this ordre at the visitacion. O Lorde,* looke downe from heaven, &c.
In thee O Lorde have I put my trust, &c.
And yf the sicke desyre to be annoyncted, then shall the priest use thappoynted prayer without any Psalme.